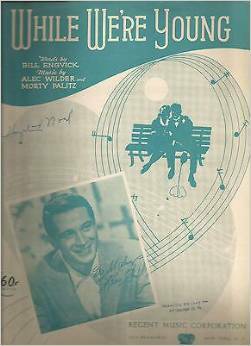 “While We’re Young” was first recorded in 1944 by the Fred Waring Singers and again in 1949 by Meredith Willson (who wrote The Music Man) and his Orchestra. Peggy Lee also recorded the song in 1949, but not to Wilder’s liking. Marion McPartland quotes Wilder as telling Miss Lee that “The next time you come to the bridge (of the song), jump off!” “While We’re Young” remains popular in the American songbook, having been recently recorded by Jane Monheit and Ben Sidron. An’ too sweet to last! Though it may be just . . .
Share our love we must . . .
( Though it may be just . . .
“While We’re Young” was recorded on May 31, 1951 and released that same year. “While We’re Young” was recorded in May, 1977 and released that year on Tony Bennett/The McPartlands and Friends Make Magnificent Music.